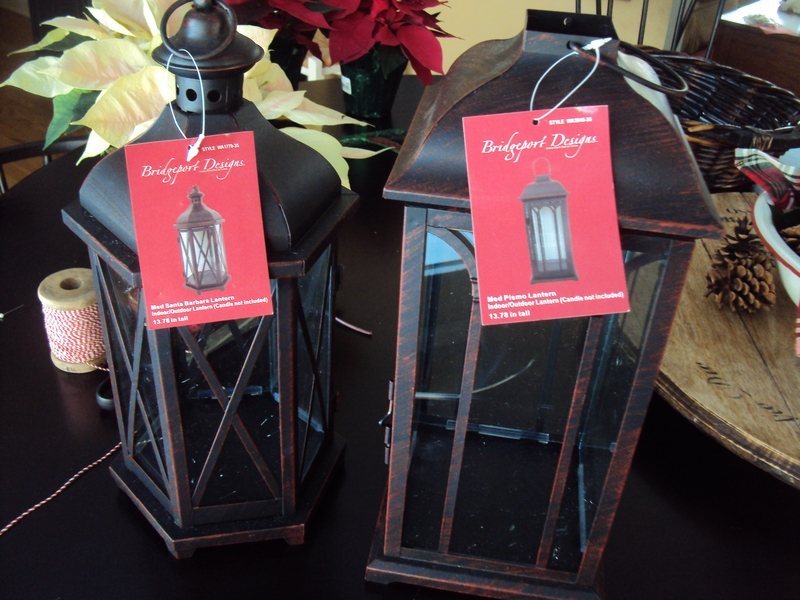 My friend Stacey turned me on to these lanterns at ShopKo. They had some great red ones in their holiday decor and then these in the everyday decor section. ShopKo is not typically known for its design aesthetic but these were solid and had nice shapes and great prices at $14.99 each. 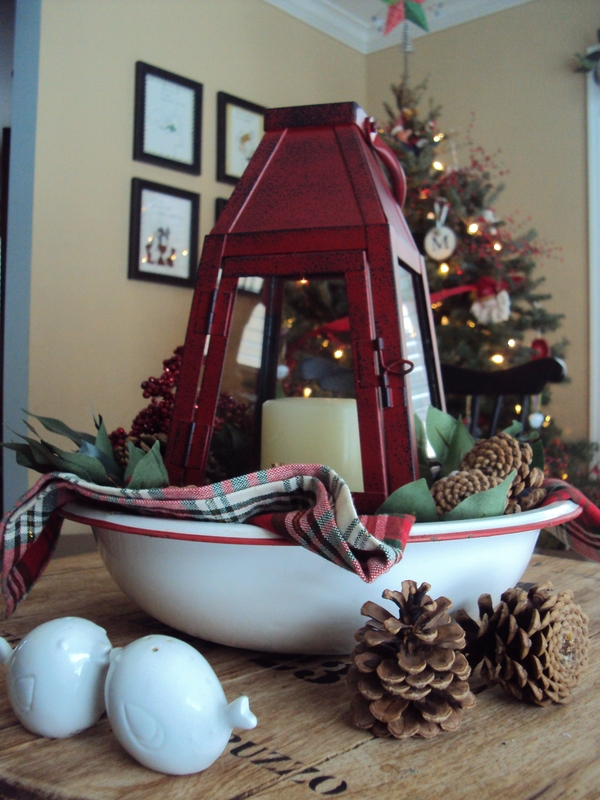 I had recently acquired an enamalware bowl at Goodwill for $4 and wanted to incorporate it into my Christmas decor. 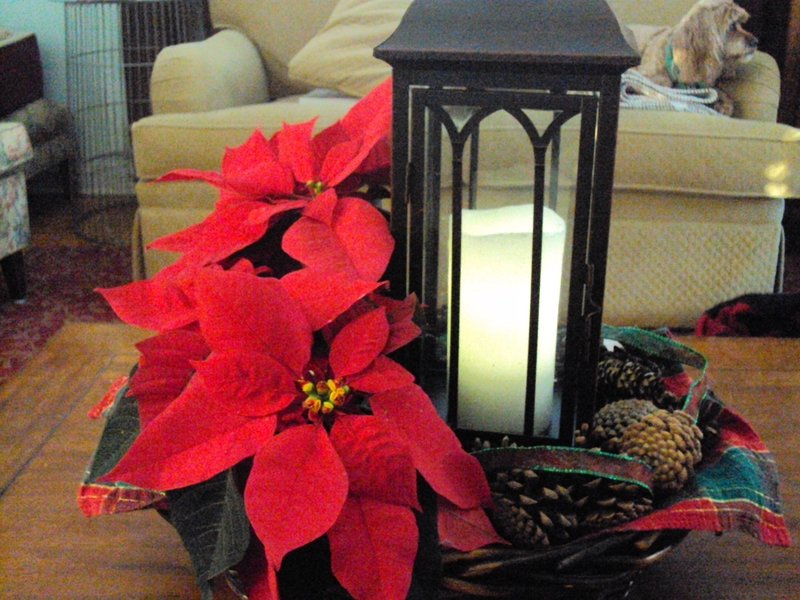 I combined it with one of the red lanterns, a Christmas napkin and leftover fake greenery and was proud of the results. Several months back I had sent my kids and the neighbor kids on a pine cone hunt because I hate to think of purchasing pine cones when they’re in ready supply around the neighborhood. The kids had a riot and I got a bagful that made for festive filler in this centerpiece. Putting this together inspired gift ideas for my hard-t0-buy-for-step-sister and my mom. 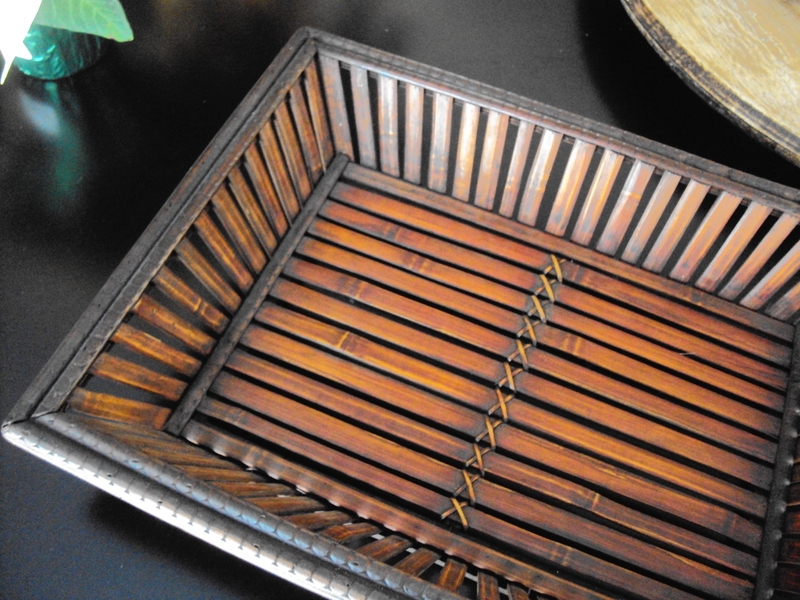 I found some more baskets at Goodwill that would make for good bases. 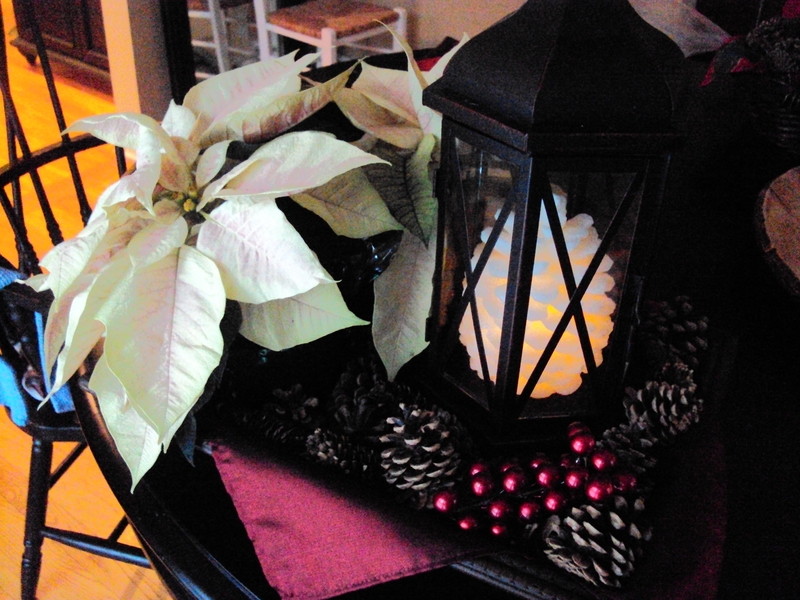 I tried to get rectangular- or oval-shaped baskets to serve as the bases because the lanterns were bigger and I wanted to incorporate some live Poinsettias. 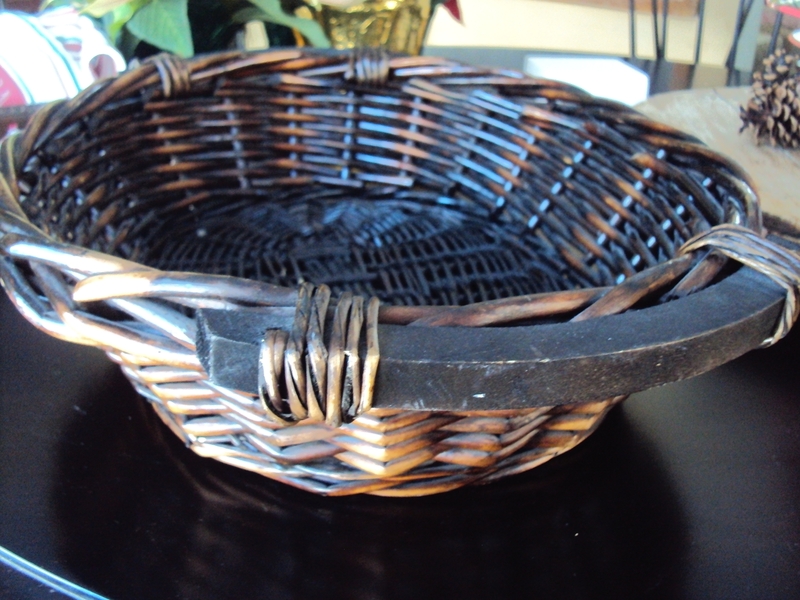 These baskets are pretty easy to find at thrift stores and run about $4 each. Stacey also told me about ShopKo’s faux candles at half-price so I picked up some of those. I had to build up the base because I wanted the piece to have some varying heights. 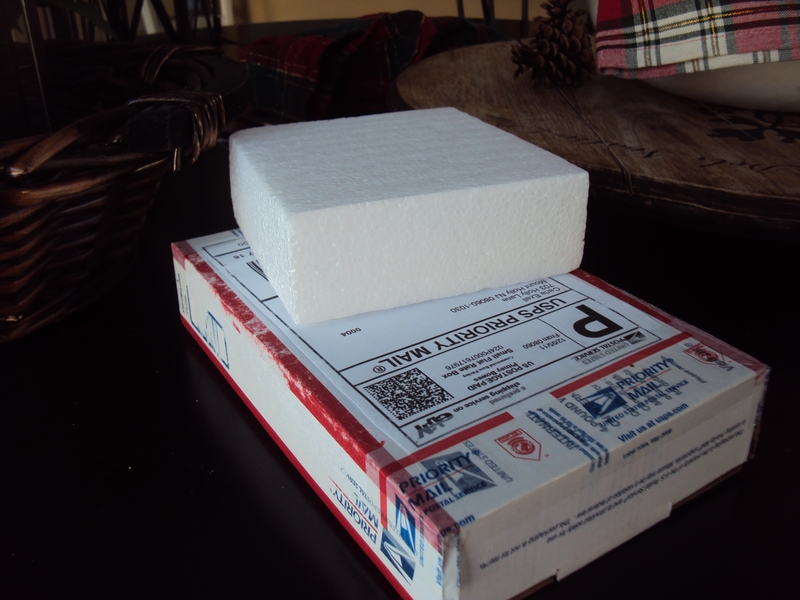 I used whatever I had around–some floral foam in one and a box, styrofoam and newspaper in the other. 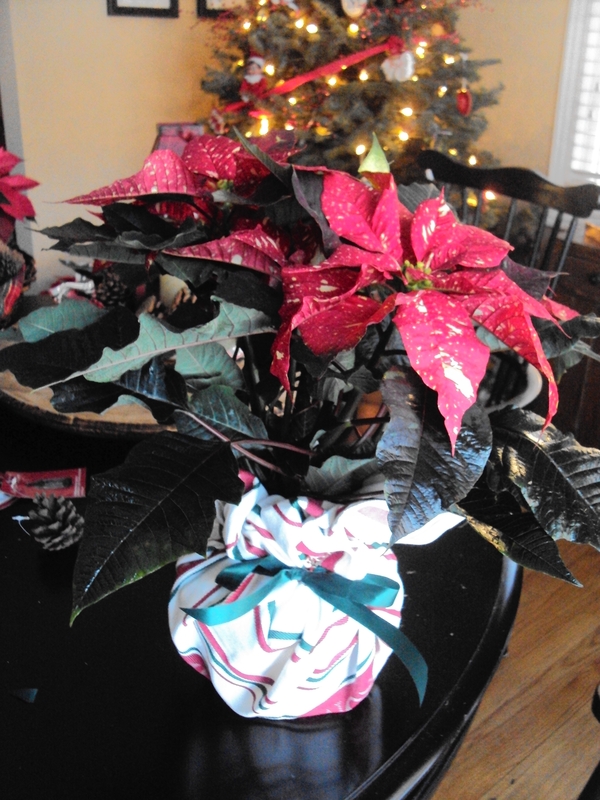 The Poinsettias were the four-inch pots from Home Depot at $3.99 each. 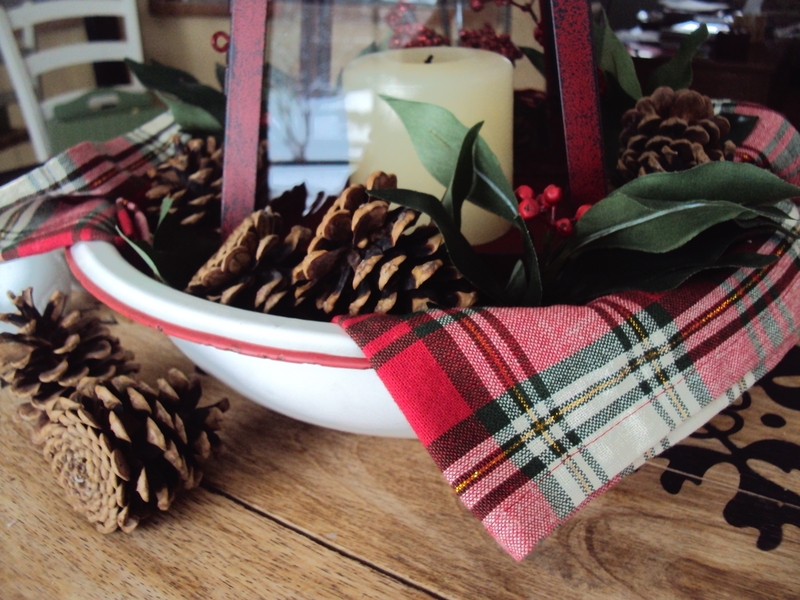 I did two in each centerpiece and filled in the rest with pine cones. 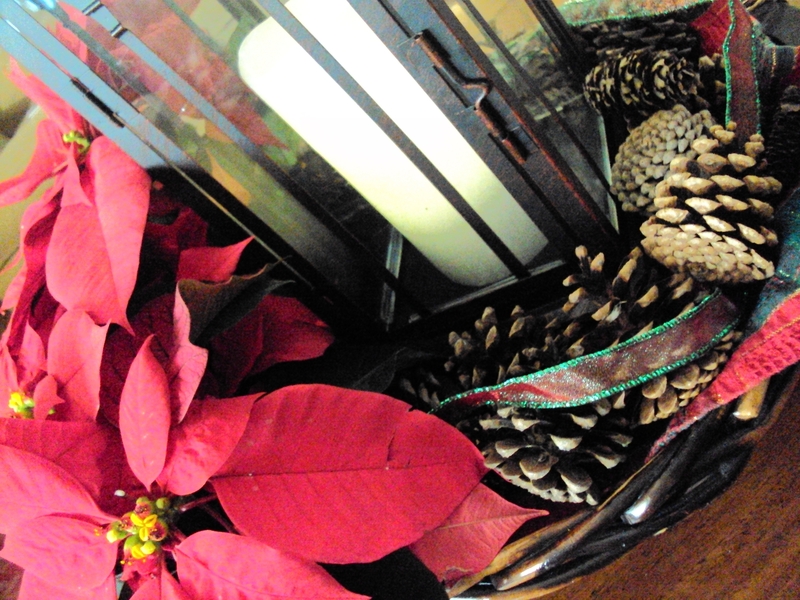 Definitely liked the more natural glow on the pine cone candle below but it wouldn’t fit into this more slender lantern. We celebrated our Christmas with this part of the family this past weekend and my stepsister and mom were thrilled with my creations. 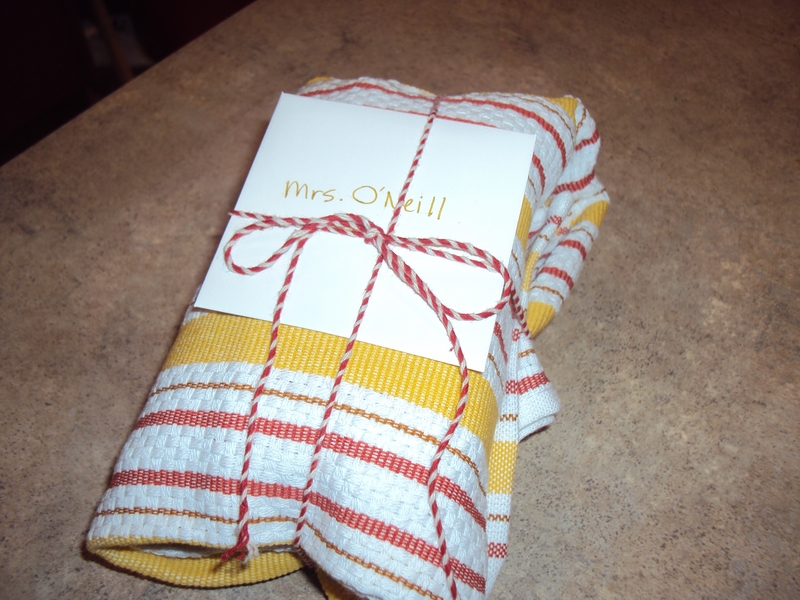 They both had future entertaining in their holiday schedule and were excited to have these inviting pieces as part of their tables. 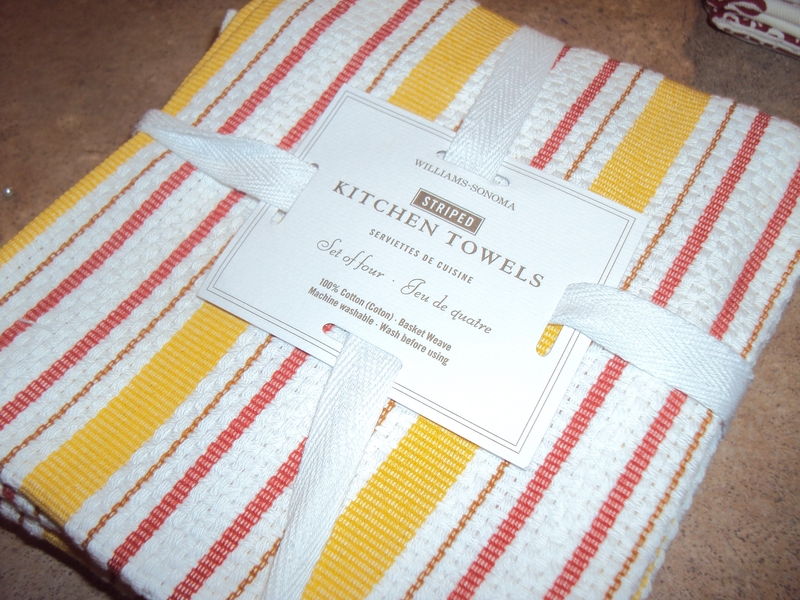 Around Thanksgiving, Williams-Sonoma puts their tableware, including dish towels, at 15 percent off. It’s not an amazing discount but it’s something. I buy a pack to use for my teacher gifts. 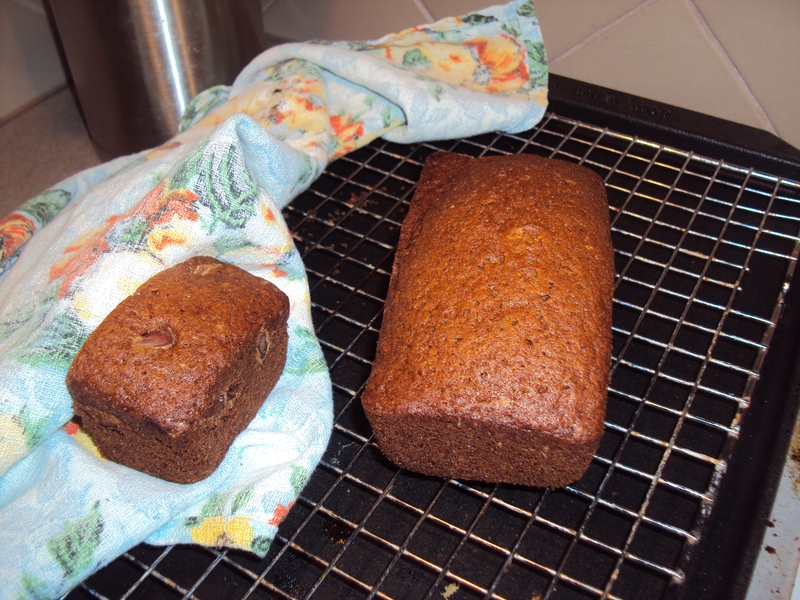 And I bake the only thing that I ever bake–Banana Bread. I love to give Thanksgiving gifts for two reasons. One – It’s one less thing I have to do between Thanksgiving and Christmas, and Two – I think it makes sense to give Thanksgiving gifts to people to whom you’re really thankful–like your kids’ teachers. This year I got some really cute string to help with my holiday packaging. I wrap the bread in plastic wrap and then wrap it in the towel. 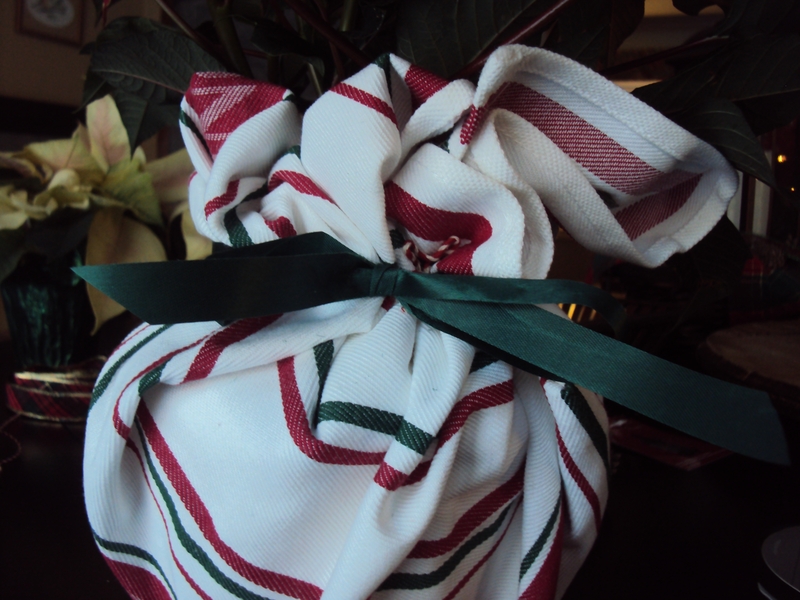 For another idea, I wrapped the bottom of a Poinsettia in a towel for a recent house-warming gift. I don’t know if anyone was making the Clever Stacy comments that I was imagining but I was pretty pleased with the results. 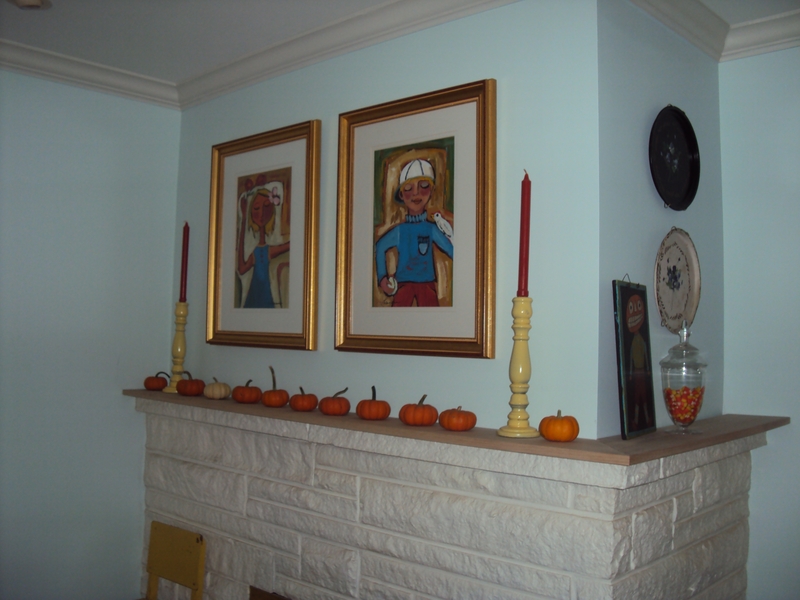 I almost hate to post such awful photography (especially when I read blogs like Miss Mustard Seed and The Lettered Cottage) but I personally want an archive of my decor from October. 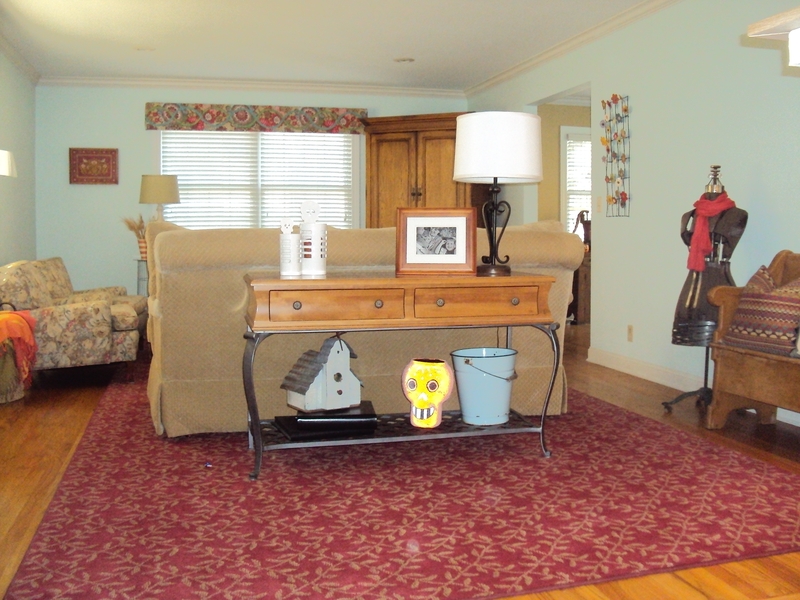 I was pleased with how the house turned out and want a record for next year. There’s that 1950s-style fireplace that I loathe! I did like the way my mini pumpkins turned out. Notice the white one (pretty clever, eh?–“one of these things is not like the other . . . “). 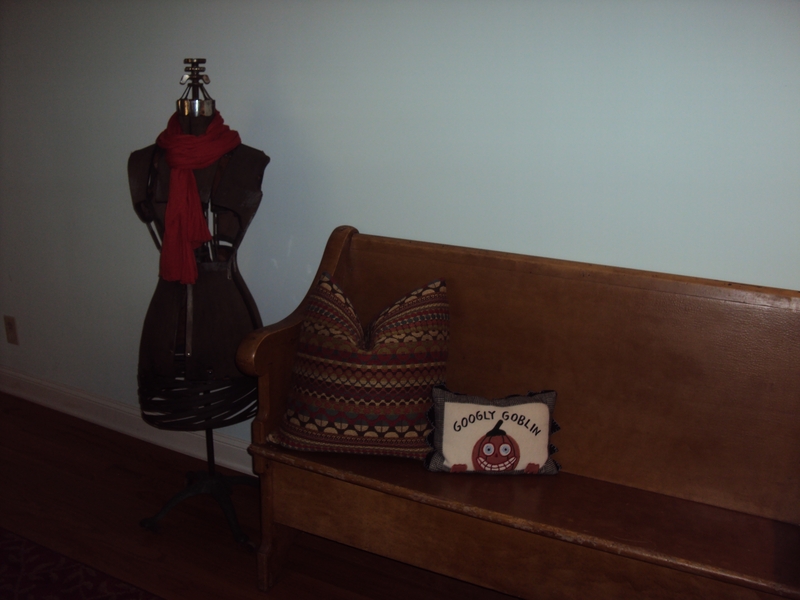 One of my recent purchases (the dress form–$68 at an antiques shop) again looks dark but gets a shot of color with a favorite orange scarf. And she (her name is Asabelle, btw) helps to break up the long, long living room wall that continues to be a challenge for me. A long shot of the long living room. My favorite part of this year’s decor was my piano top. 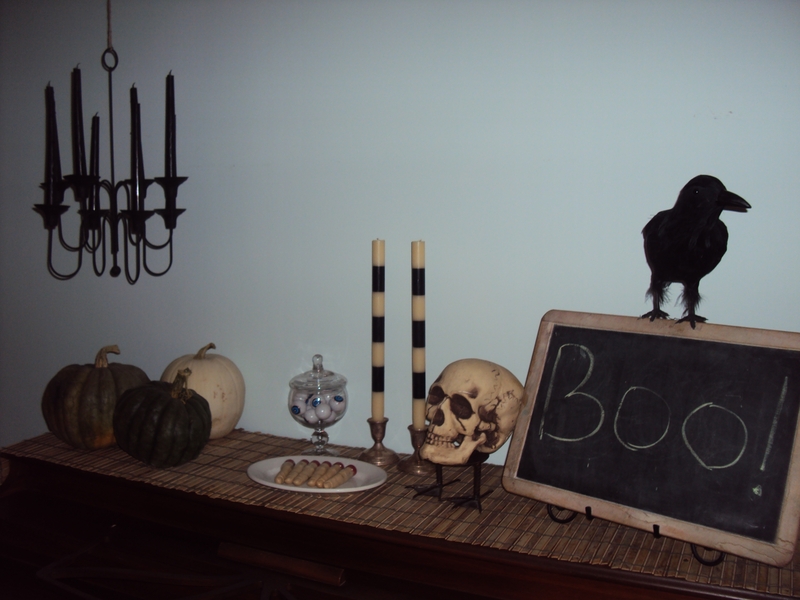 Again I wish it was lit better for a better photo but I was proud of the candle chandelier ($2 at an estate sale) that I hung from hemp twine from the ceiling, the use of my chalkboard, a candy bowl full of eyeballs, a plateful of fingers and no color orange in this spooky vignette. A tighter shot . 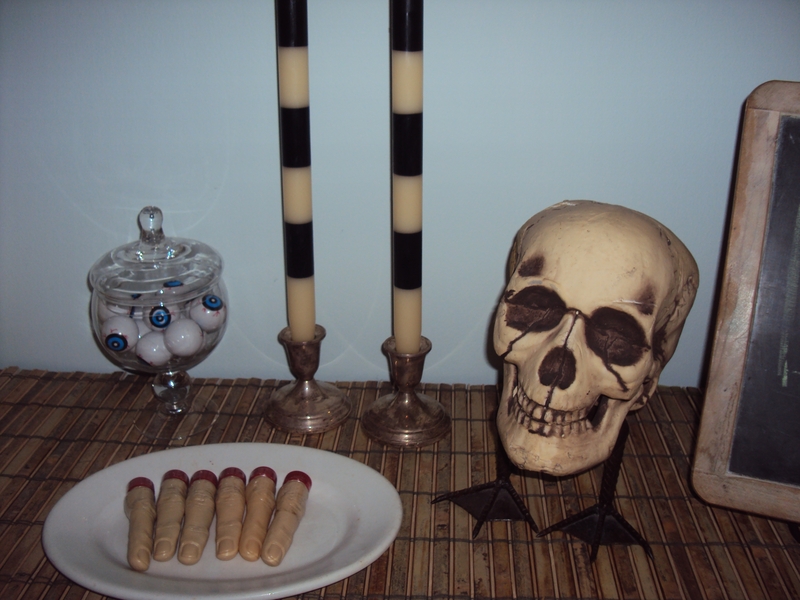 . . do you like the duck feet (a candle holder) on the skull? OK, and the fingers are actually tubes of bubbles. Next year I will look for something more authentic, but the kids sure liked these. 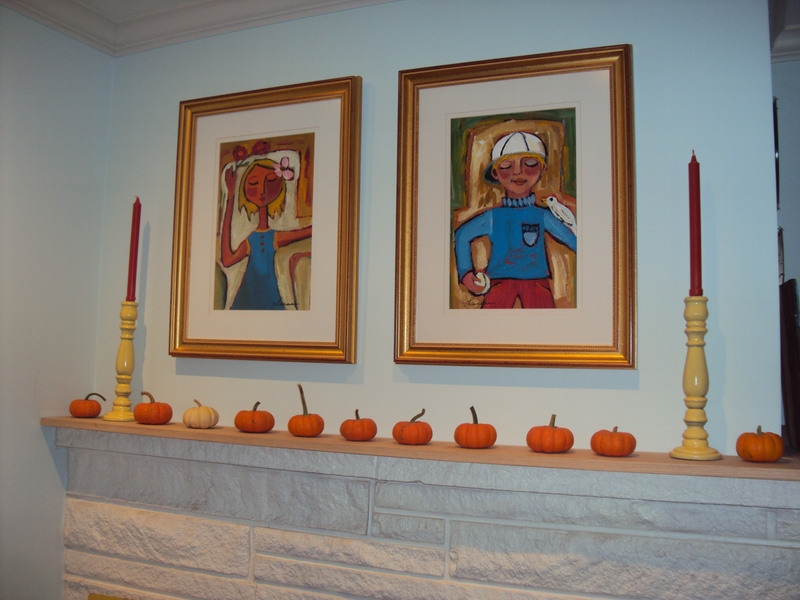 Some of this stuff will translate well right into Thanksgiving decor, which is nice. Well, my 31 days of progress didn’t totally turn out like I’d expected. Life, as usual, got in the way. But I did complete this project that has been on my list for actually a couple years. And it’s only the 23rd of the month, so I’m pleased. 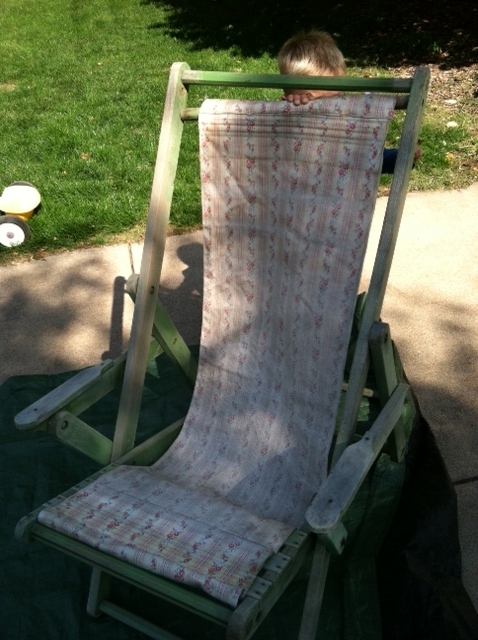 Here’s the chair before. I picked this up at an antiques market in Iowa for $8. 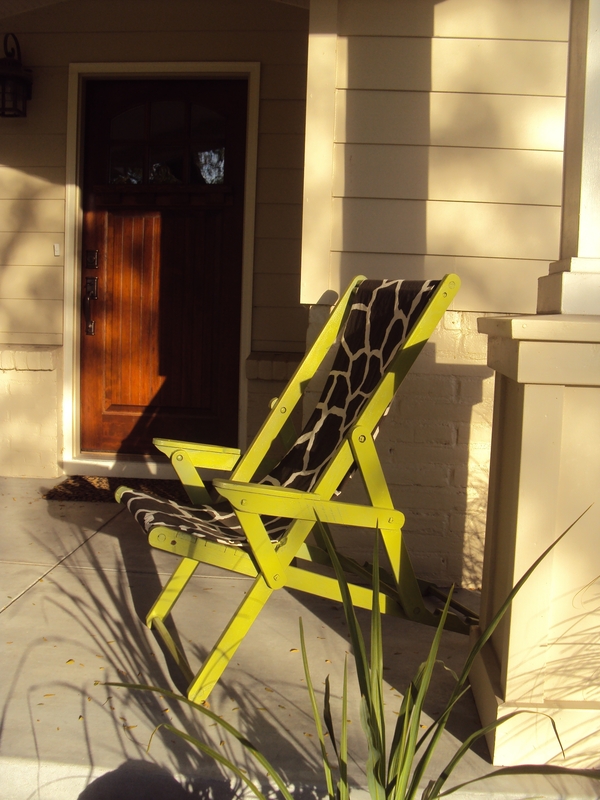 I already own one of these old hammock chairs and it’s on my front porch most of the time. I love them. 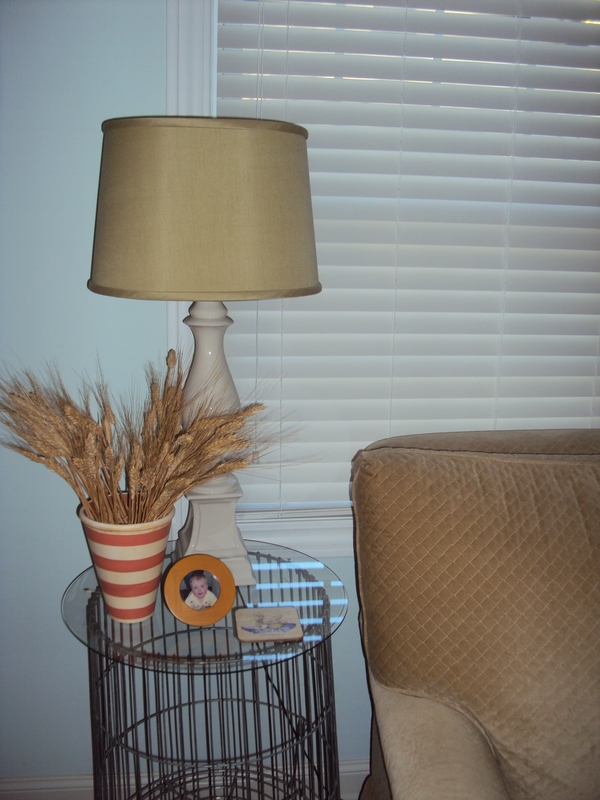 They are comfortable and easy to store and have a fun architectural element to them. 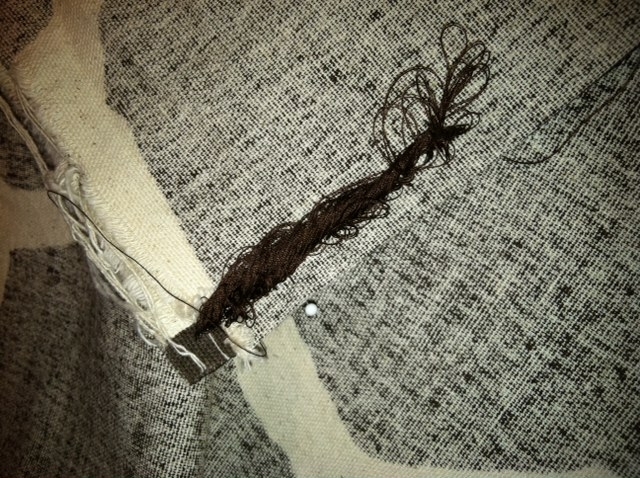 The frame and fabric of this one were worn out. So my hubby and the neighbor helped remove screws and sand it down. 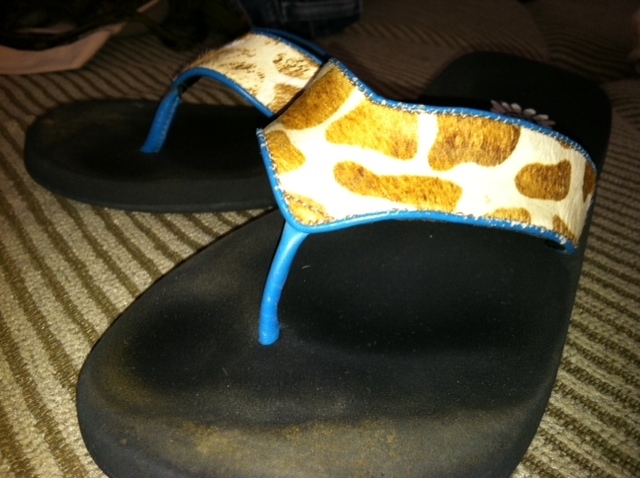 And I found inspiration in my favorite flip flops. 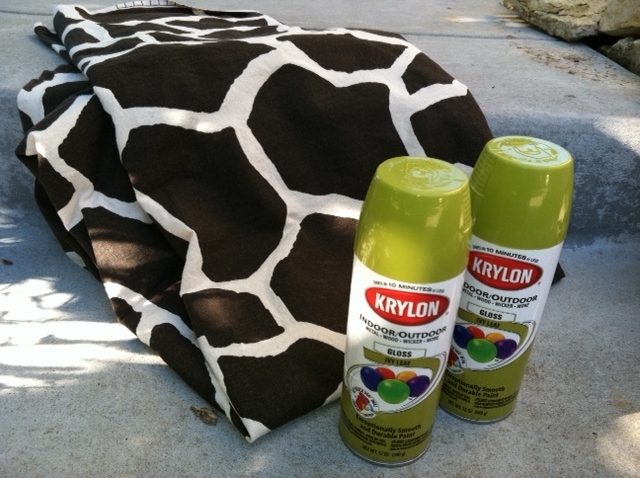 And I finally found the perfect green in a spray paint can at Joann’s Fabrics. 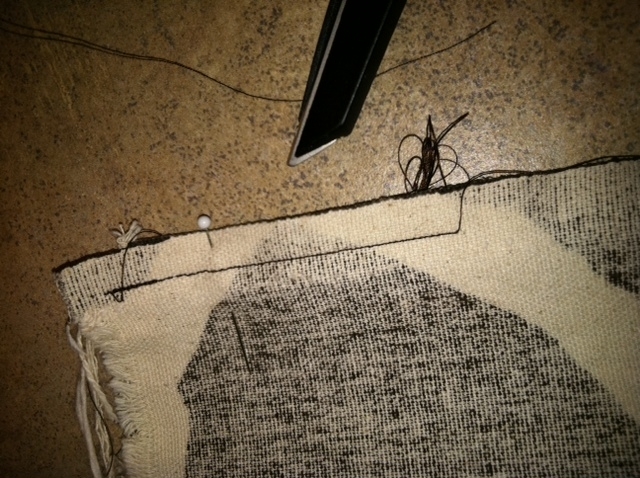 And I’m no seamstress so the sewing, even just the simplest of seams, can pose a challenge. For some reason the bobbin has to be wound a certain direction. This was clearly the wrong direction. Kinda looks like a messy caterpillar but I kept repeating to myself The Nester’s Mantra that “it doesn’t have to be perfect to be beautiful.” So after 23 days, tiny bits of time and effort squeezed in here and there, I think it’s beautiful. And guess what? It’s comfortable too! 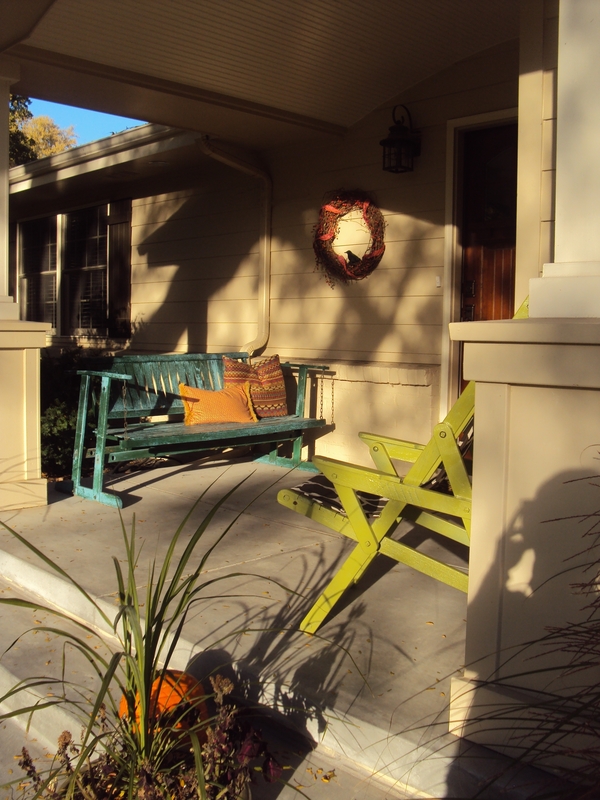 It’s a nice fall touch to my porch. I even like it with the chippy blue of my favorite glider swing. 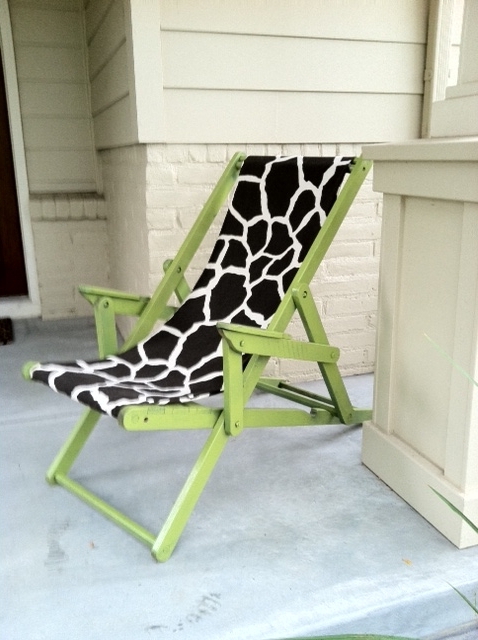 So this morning I crossed this off my long list of home projects with a great sense of accomplishment. And now I move on to the next item. Until then, here’s to small but productive bits of progress. Read more about this chair here and here. Not sure if it’s fair to get two posts out of my painting but it has taken me two days. I truly thought that two cans of the Ivy Leaf would cover the chair but it didn’t. So I had to go back to Joann’s, this time with no coupon (Boo!) and get one more can. And it makes me sad that they lock the spray paint in a glass cabinet and you have to get someone with a key to get it out. And two different Joann’s gals asked me if I was 18, which they definitely knew I was btw because of the Crow’s Feet, but it was their policy. And is it snide and uncaring that I don’t understand how a teenager could sniff spray paint and it not be written (literally) all over his face? It’s funny to envision (in a sick sort of way) and God-forbid if my kids ever sniff anything! But anyway, that’s how life rolls with a job and two littles . . . you get one free hour to paint and MAYBE one free 30 minutes to run to the store. Thank God I work part-time. I’m discovering my Tuesday and Thursday afternoons are precious for productivity. I don’t know what got into him, but MM started sanding the other day. Well, first he and the neighbor helped me tackle the rusted old screws that were holding onto the dowels that were holding onto the fabric. It was literally a two-man job and still they couldn’t remove one of the screws. 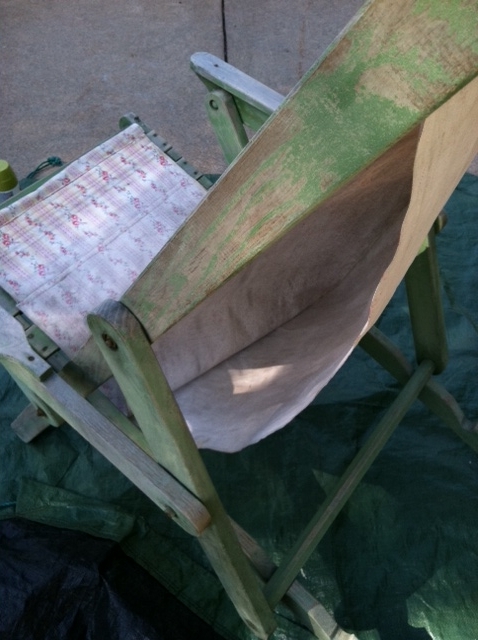 But then he started sanding (without being asked) . . . So I just stepped away, grabbed my phone to take another good quality iPhone pic, and shut my mouth. He’s the best husband but he’s not so much for the hands-on work or the honey-do list or the taking over these little projects that I take on. That all said, when he does get involved, things are always better. He’s got a surprisingly (especially for a straight guy) eye for color when I need an opinion. And he’s a good painter. 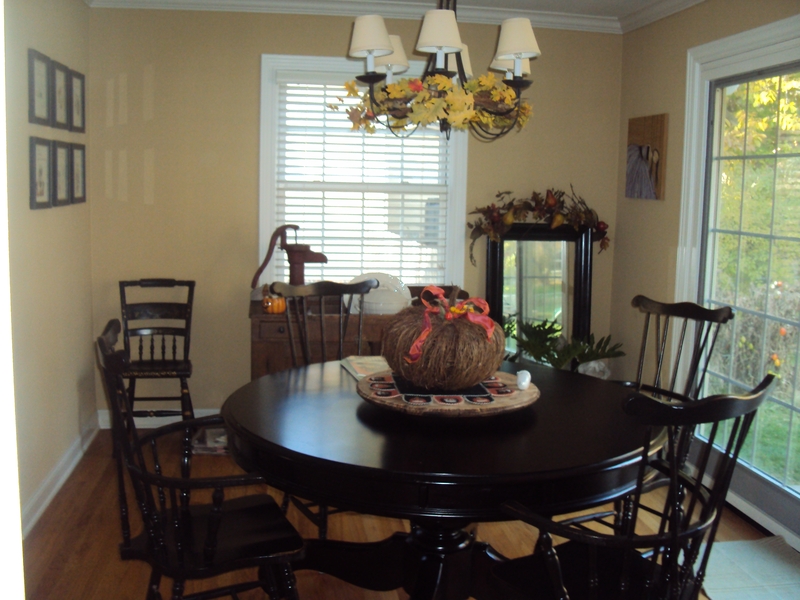 When he did the armoire/pantry, it looked professionally done. And so I really appreciated the sanding. So this bit of progress is brought to you by Mike . . . The “before” . . . duh! So I’m a bad blogger. 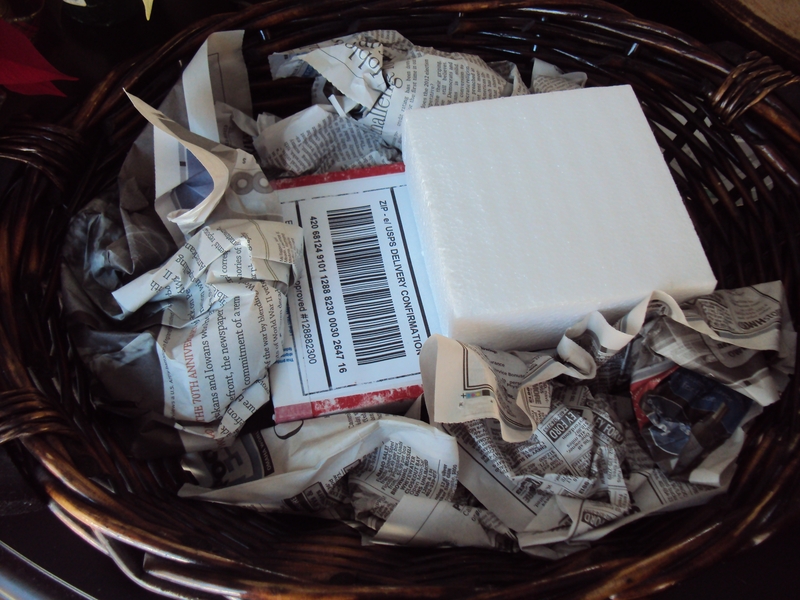 There’s nothing better than a good “before” photo and I forgot to take one. 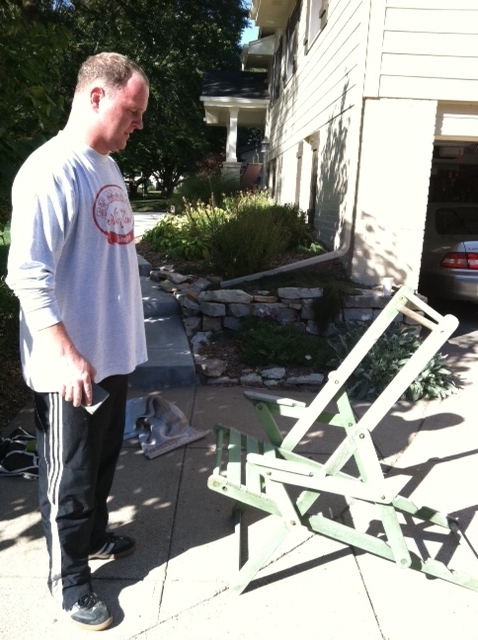 Here is a mocked-up one taken before we started painting. 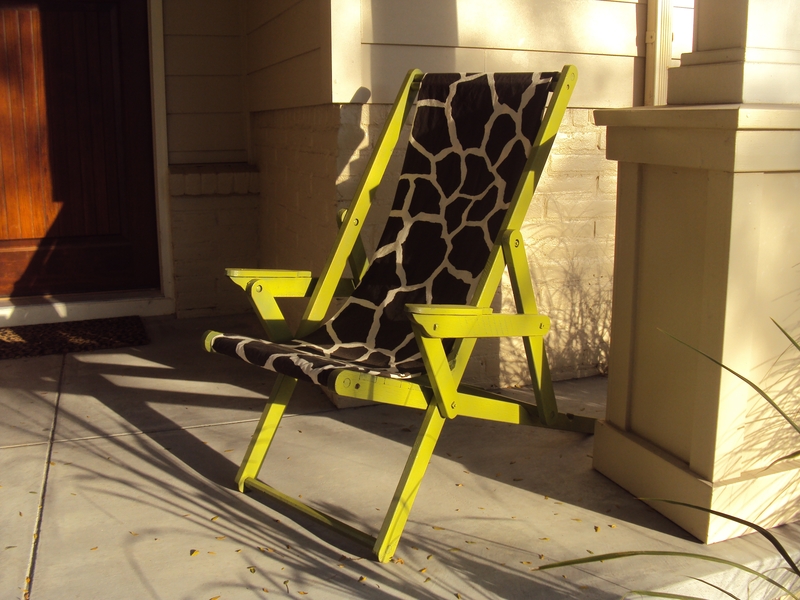 Although the chair is sanded, you get the idea . . . 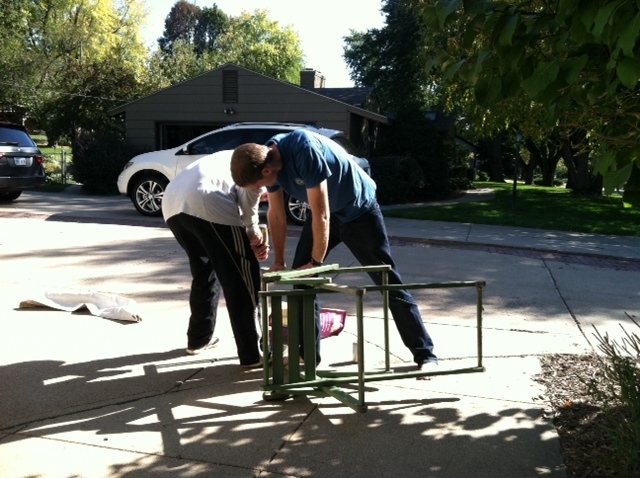 It was pretty rough (ps – My little assistant is helping me in this one. We spend Tuesday and Thursday afternoons together and he’s getting quite good at thrifting and painting and being patient with my little projects). 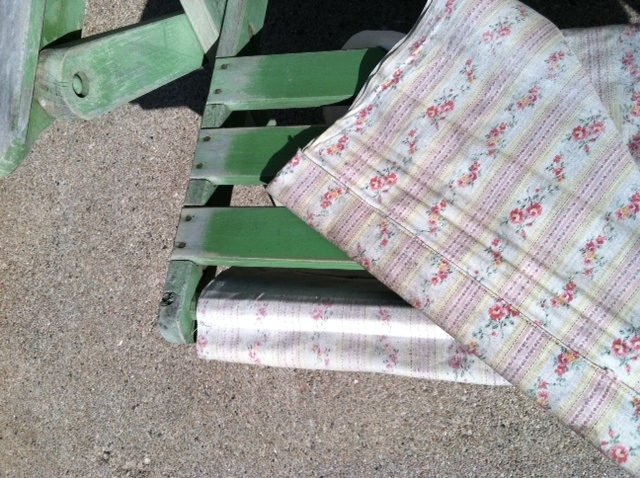 I liked the fabric . . . at one time, it was definitely pretty but it was mildewy and completely faded. The green is going to work well, I think, as the background of the new Ivy Leaf. I’m hoping it will take a few less coats. Here’s to small bits of PROGRESS at a time.